This summer Ed got us a subscription to Fine Cooking Magazine. He bought the June issue on a whim and liked it so much he decided to subscribe. I am sure he had the best of intentions. Now, I realize subscribing to a cooking magazine without consulting your spouse is not like buying a car without consulting your spouse, but it felt like a big deal to me. I take my food magazines very seriously, and I’m really only loyal to two: Cook’s Illustrated and Bon Appétit. Inviting another magazine into our home is serious business. I just didn’t know about this and needed some time to adjust. Part of it, too, is the name. Fine Cooking? Seems a little pretentious, no? It reminded me of the SpongeBob episode featuring “Fancy Living Digest.” In fact, I’ve taken to calling it “Fancy Cooking” in my head. But like all change, I warmed up to it after a few months. Sure, the lasagne recipe is six pages long, and recipes like that will always annoy me, but you can’t be all things to all people. It almost seems like a cross between Cook’s Illustrated and Bon Appétit, both cerebral and high quality, so as usual, Ed was on the right track. Once I stopped being mad at the magazine and started to actually read it, I found quite a few intriguing recipes I look forward to trying. Yesterday I made their German Chocolate Cake featured in the December 2011/January 2012 issue. First things first, this cake was 100% WORTH THE EFFORT. If you like German Chocolate Cake, I highly encourage you to try this one. In fact, I dub this The Best German Chocolate Cake I’ve Ever Eaten. I consider myself a solid but not advanced baker, so this was definitely one of the fussier and more elaborate cakes I’ve ever made, but I don’t think any advanced skills are required as long as you are patient, read the recipe thoroughly and follow directions carefully. I have documented my pictures and notes below the recipe. Position racks in the upper and lower thirds of the oven and heat the oven to 350°F. Grease the sides of three 9×2-inch round cake pans with butter and line the bottoms with parchment circles. Put the chocolate in a small bowl and pour the boiling water over it. Let stand for several seconds and then whisk until the chocolate is dissolved. 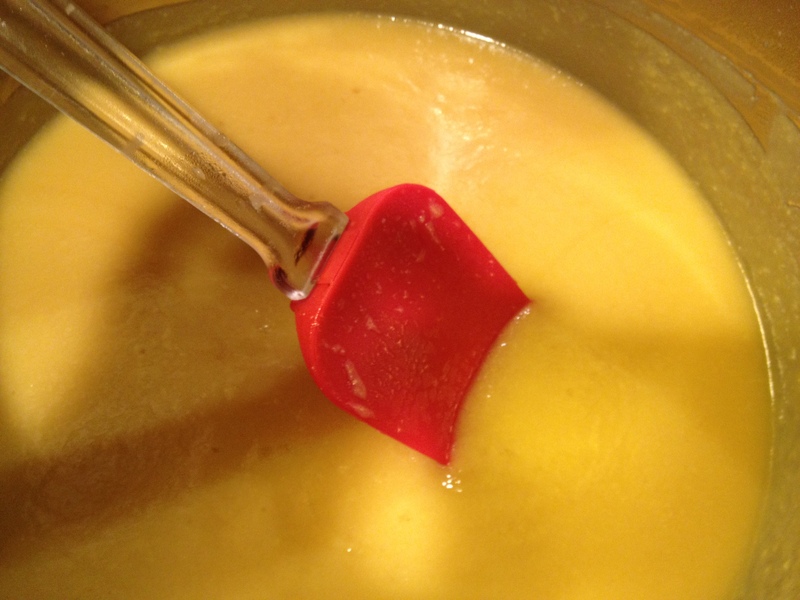 Set aside until cool to the touch before mixing the batter. Sift the flour, baking soda, and salt onto a sheet of waxed paper. Whisk the eggs in a small measuring cup. Beat the butter for a few seconds in a stand mixer fitted with the paddle attachment on medium-low speed. Add the sugar in a steady stream and then beat on medium speed, scraping the bowl as necessary, until the mixture is lightened in color and fluffy, 4 to 5 minutes. Still on medium speed, add the eggs a little at a time, taking a full 1-1/2 minutes to add them all. Add the melted chocolate and vanilla and beat just until blended. With the mixer turned off, add a quarter of the flour mixture. Mix on medium-low speed just until incorporated. Add a third of the buttermilk and mix until blended. 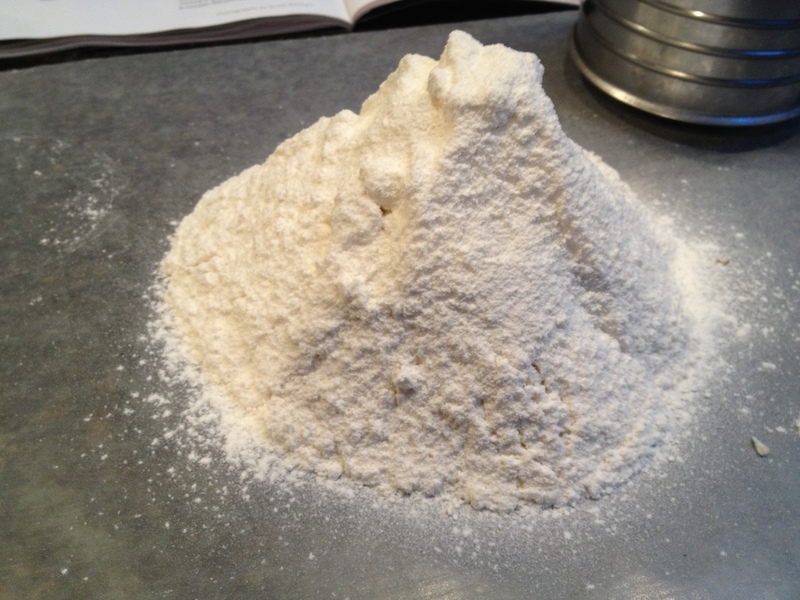 Repeat, each time adding another quarter of the flour, then a third of the buttermilk, until the last of the flour is added. Scrape the bowl as necessary and mix each addition only until it is incorporated. Divide the batter among the pans and spread it evenly. Bake, rotating the pans and swapping their positions, until the cakes just start to pull away from the sides of the pans and spring back when very gently pressed with a finger, 20 to 25 minutes. Let the cakes cool in their pans on a rack for 10 minutes. Run a knife or small spatula around the edges to separate the cakes from the pans. Turn the cakes out onto the rack and peel off the parchment. Cool completely. Spread the coconut on a rimmed baking sheet. Bake at 350°F, stirring every 2 minutes, until golden-brown, about 10 minutes. Scrape the toasted coconut onto a sheet of waxed paper and let cool completely.Whisk the egg yolks with the evaporated milk, sugar, vanilla, and salt in a heavy-duty, nonreactive 4-quart saucepan. Add the butter. Set over medium heat and stir constantly with a heatproof spatula, scraping the bottom and corners of the pot. When the mixture starts to boil, adjust the heat so that it boils actively but not furiously, and cook, stirring constantly, until golden and thickened, 3 to 4 minutes. 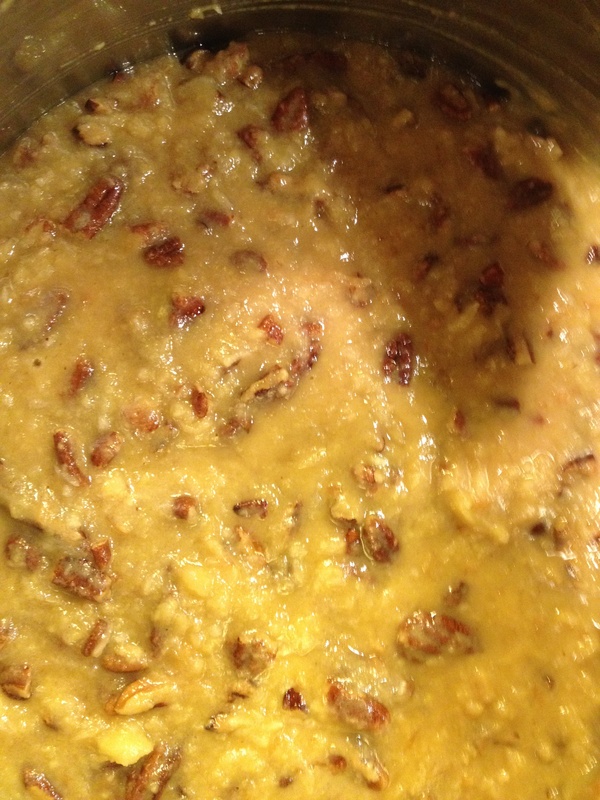 Off the heat, stir in the coconut and pecans. Let cool completely. Put one cake layer on a cake plate. Spread a third of the filling over the top of the cake, leaving a 1/4-inch border. Top with a second cake layer. Spread with half of the remaining filling. Put the third cake layer on top and cover it with the remaining filling. Leave the sides of the cake exposed. Serve at room temperature. Sifting the flour onto a piece of waxed paper was my first hint this cake might be a little high maintenance, and it’s when the carpal tunnel first started to kick in. Do not skip this step! It’s really important to get the right level of heat and constant whisking for the filling so it is the perfect consistency. If your wrist didn’t hurt you before, it will now! Add the toasted coconut and toasted pecans and let cool and thicken. It may not look pretty, but this is the most delicious filling I have ever eaten. While this cake didn’t turn out cover-model beautiful, it was perfect in every other way. p.s. Ask Mom Mom is taking a break this week. Is it because someone can’t find her old-school notebook with this week’s column in it? I’ll never tell. p.p.s. Sorry to my subscribers for the flukey phantom Cake2 post earlier. I am still playing around with my new phone and attempted to upload a photo to WordPress, and I didn’t mean to publish anything. Oops! 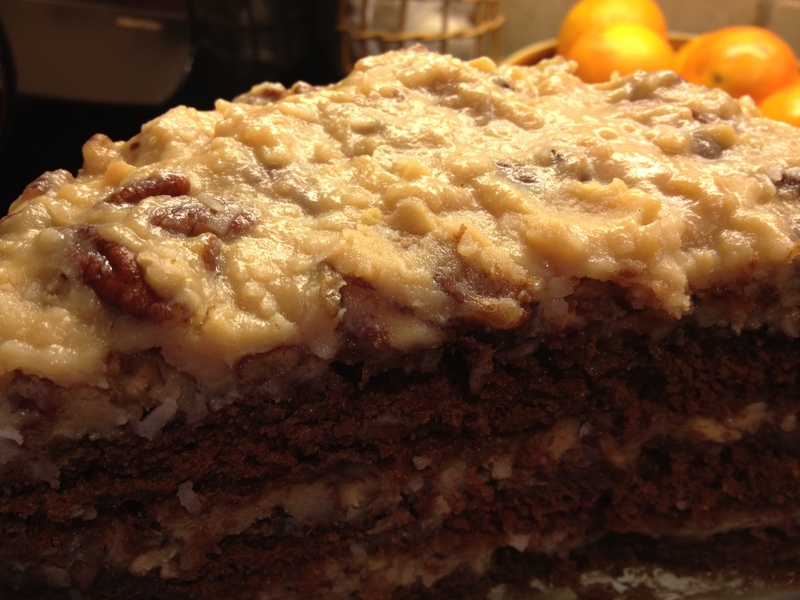 This entry was posted in Desserts and tagged Best German Chocolate Cake, Fine Cooking by Mom Mom's Apron. Bookmark the permalink. This cake is delicious I just made it for second time tonight and after all that work I realized that when I consulting my iPhone for edge recipe I left out the egg whites ughhhh! I couldn’t figure out what was wrong until I read your post. Ugh, how sad! Believe me, I could devote a whole blog to my cooking errors alone. This is definitely a cake that required my maximum concentration! Did you leave out the egg whites for the cake part and only use the yolks? Or did you mean to say you left out the yolks for the filling?